The timber frame cottage is an iconic part of the English landscape and a reminder of England’s great building time when carpentry and craftsmanship was at it’s finest. England was once a kingdom carpeted with fen marsh and oak forest until about 400 years ago. Stone was used on all the important buildings such as churches and castles and timber was the vernacular mode of construction for cottages and other dwellings. Timber was on hand and easier to move than stone, of which England also had a natural supply. It was during England’s great building time of 1570 to 1620 that the great oak forests began to deplete. Cities would also have been build out of oak. London was a city built with timber-frame construction, we have a record of this because of the great fire in 1666. Oak was the preferred timber for construction because it was plentiful, strong and hardens with time, and it makes the building look picturesque on the landscape all warped and twisted with age, like the old oak tree itself. Oak is used ‘green’ as its easier to work with but many cottages may have older oak that came from another building before hand. Oak is prized as a building material either ‘green’ as its easier to work with, or aged as oak grows harder and tougher with time. Cottages were not the only thing oak was used for, it was used inside the structures and in the roofs of great cathedrals, thousands of oak trees were felled at Henry VIII command for building the Mary Rose and other ships. It was used for tools and the list goes on. “Oak never falls out of use.” William Harrison. …Early day conservationists cried out “For every 40 acres owned, plant an acre of oak.” The plea fell on deaf ears and its hard to imagine that most of Britain was once a heavily forested land with bear’s and wolves running free. Cruck, Cruck Frame Mortise and Tenon. 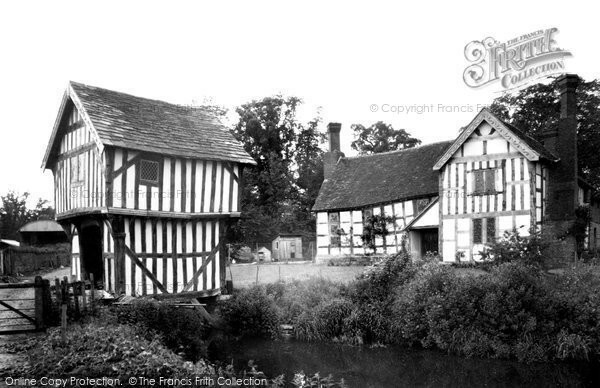 The simplest form of timber-framing comes from the early ‘cruck’ or ‘cruck frame’ construction. The cruck frame differs from other timber-frame construction in that the roof is an integral part of it’s structure. It is not dependant on its walls and the walls can even be renewed, moved or replaced without disturbing the roof. A huge tree trunk, almost invariably oak, is split length ways. There is a natural bend in the wood, these are called curved or elbowed timbers or ‘blades’ (often called ‘gavel’ forks) which are then joined together by a ridge-pole and horizontal beams to create the basic structure. Timber-frame construction is normally done in the carpenters workshop before hand, the carpenters workshop itself was once called a ‘framynplace’ here the carpenter would mark the pieces with numerals before being taken to the site. On site the cruck frame would be erected onto the ground or a damp course of stone or brick. The ‘blades’ would come together, at equal length, at the apex of the building. It would look like an inverted boat frame with the roof descending from the ridge pole to the ground. Nails were never used. The beams were secured together by mortise and tenon. Mortise and tenon is a way of securing the timber frame together, it is used in construction (and furniture making). The mortise is the beam with a rectangle shaped hole chisled out, and the tenon has been cut into another beam to fit snug into the mortise. In more simpler terms the tenon is the (rectangle) peg (cut at the end of the beam) and the mortise is the (rectangle) hole where it fits. As the wood ages the mortise and tenon join together. It is this simple technique that has allowed the cottage to survive, nails would have destroyed the wood by now. The building would normally be a rectangle shape. 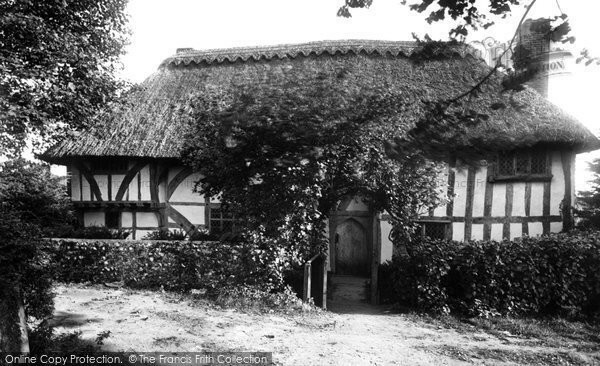 Cottages built with a cruck frame had a problem. All though they look charming the upper floors would have been cramped with a low ceiling, the width of the house was limited by the length of the trunk and as enormous tree trunks would have been needed for more room. The depleting forests of large oak trees could not support long term building. Another solution was needed. The old traditional cottage that we know is called a ‘half-timbered’ or ‘post and panel building’ these are the very old English Tudor cottages. This structure, where the roof rests on all uprights, allowed for more space in the upper rooms. The ‘post-and-truss’ construction is where key uprights support the roof. They would have been built and seasoned before hand in the carpenters workshop, like the cruck frame, and constructed on site, piece by piece in a box like shape. The main posts were huge from 8 to 10 inches square. The intermediate posts varied from 6 to 2 ½ inches to 8 by 4 inches, these were not square in section. They used great square beams to carry the second floor and the roof. Again nails were not used, the frames were fixed together by mortise and tenon. The foundations were of any stone that was readily available, in cottages built later the foundations were normally brick. Once the frame was set up on site it was a time for celebration. 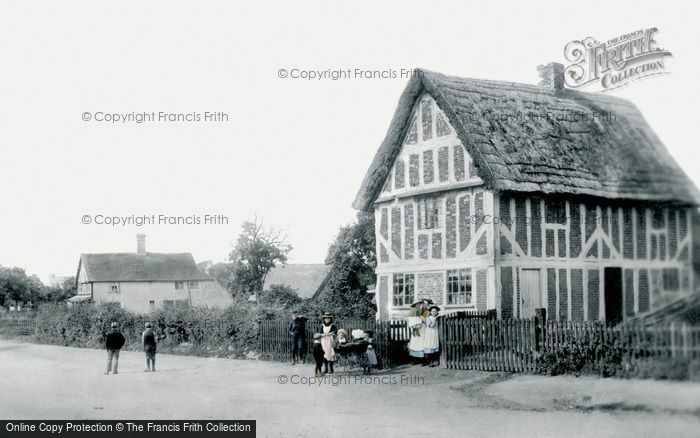 Above Photo: The first National Trust building; The Clergy House in 1894. Here you can see the 'bones' of the timberframe before it is restored. The craftsmen used the timber in ingenious ways adding to the beauty of these buildings one of which was to use the gnarled and twisted timber to create a projecting upper floor which added to the space. They would use the root part of the upside down tree in the massive door posts and normally in the corner posts. The outward curve of the root was called a ‘spur’ and helped support the projecting upper story. Heavy girder beams were then laid horizontally between the posts which projected outwards to about 18 inches. Photo below: A superb example of Cruck frame construction in the first cottage and jettying in the cottage behind it. There are several ways to tell the age of a timber-frame cottage. The most scientific is dendrochronology, the analysis of tree rings in timber. A tree trunk or branch will add a ring each year, this varies according to climate conditions. Oak provides a clearer pattern than other timbers such as beech or ash. Experts can even tell the age of a tree when it has been felled by reading the tree bark on the outer edge if it is still attached. The more sapwood present in the sample the more precise the analysis. There is normally a few years gap (approximately 3) between felling the tree and construction. The other way to tell the age of a timber frame cottage is by the spacing of the timbers; the more timber used normally means the cottage is old. It was either built while oak was plentiful or it was built later in an area where oak was still plentiful, such as the Welsh boarders. The areas surrounding cities and towns would properly been depleted of oak first. You can normally get a general idea by looking at cottages and construction nearby; if it’s the only cottage with lots of timber used it is properly older than the others. On larger, more ornate buildings that are newer, the timber framing may be plentiful because the builder had more money to spend on timber. Photo below shows an example of timber frame close together on the detached jettied 15th century gatehouse in Lower Brockhampton manor house. For more information about wattle and daub, 'white wash' and local varieties of colour go to the wattle and daub page. Brick was used in later cottages as the infill especially in Kent and Surry. The bricks would sometimes be laid in an herring bone pattern. This would not be enough to waterproof the old bricks over time, so a covering of lime plaster (which allows the bricks to breathe) would be used. Kent is famous for ‘brick noggin’ in which the outside walls had a traditional patterning of white flowers against a background of red or black plaster. Photo: Timber frameing with brick infill. 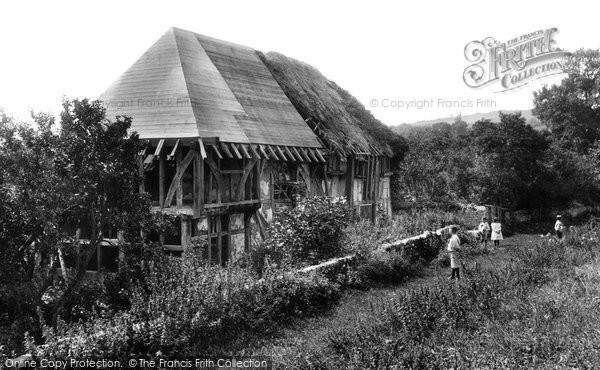 Note the 'bones' of the roof under the threadbare thatch. Another way to protect a cottage from the weather is less decorative and less permanent, called weather-boarding. These are large expanses of flat boards cut out of the log, normally Elm, with the bark left on, they lay horizontal on the outside of the cottage. The natural, irregular lines of the wood curve, and are pleasing to the eye, especially as the they fade into a wonderful pale grey colour. Weather-boarding can also be tarred for extra protection from the elements, fading to a deep shade of purple and blue. The old technique of weather-boarding was used quite a lot on ‘outbuildings’ in the farmyard. Another popular way to waterproof a timber frame is to tar the timbers. This creates the ‘Black and White’ or ‘Magpie’ cottages. This was done around the Welsh boarders and in the North country mainly all though you can find them in other counties as well. 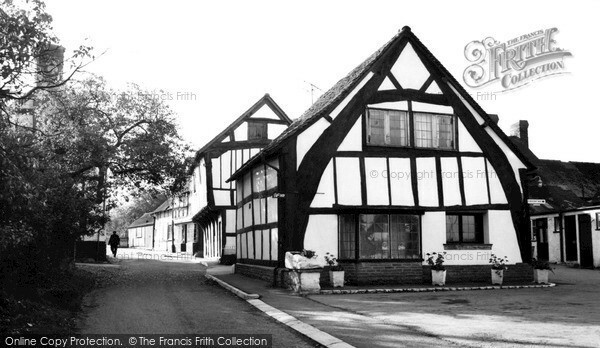 Timber frame cottages and buildings were once built all over England. You can find them in most regions especially in East Anglia, the South and the Heart of England. Here is a selection of English counties that have a lot of timber frame cottages. 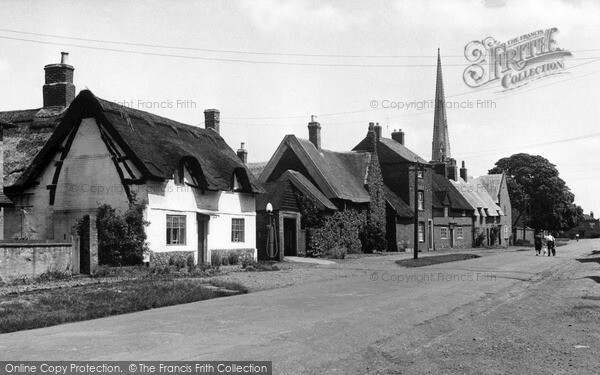 My love of timber frame cottages began at a early age, growing up in the county of Worcestershire there were an abundance of them, alas, not so many now. When I was older I helped a craftsman clean off the old beams in an old cottage that was being renovated. It was then that I truly became smitten with these beautiful buildings, these are the cottages that have hidden nooks and wonderful character, many of them ramble on, after being added onto over many generations. They are, in my mind, works of art. "Picturesque English cottages And Their Doorway Gardens"